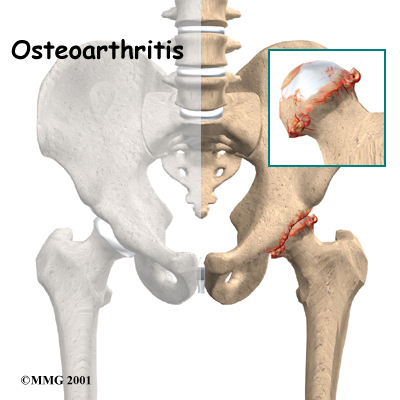 Diagnosis of hip osteoarthritis can be difficult in the beginning. This is because pain can appear in different places including the groin, thigh, buttocks or even the knee. The type of pain also varies. It can be a sharp, stabbing pain, or perhaps a dull ache often causing stiffness in the hip and a lack of mobility. Osteoarthritis of the hip is mostly diagnosed by means of an X-ray which shows abnormalities such as a narrowing of the joint and the appearance of some bone spurring. Are there specific causes for osteoarthritis of the hip? The actual reasons for this affliction are not fully known, although there is a consensus that contributing factors may include joint injury, advancing age and serious overweight issues. There are also genetic issues such as a malformation of the joints and possible inherited defects in the cartilage. The word arthritis means “joint inflammation “ and although the hip can be challenged by different kinds of arthritis, osteoarthritis is by far the most common. Is hip osteoarthritis a serious condition? It is considered to be a progressive, chronic disease which becomes more severe with time. However, if you suspect that you may have osteoarthritis of the hip, take heart, it is not deadly! The disease is treatable, so if you have joint pain, stiffness or lack of hip mobility, seek medical attention for a full examination, so if need be, treatment can be initiated. Some facts regarding hip osteoarthritis. Hip osteoarthritis is not a normal result of aging. Most older people never develop this problem just from growing old. It has also been established that many younger people experience this form of hip arthritis. There is a lot than can be done to alleviate the pain. Special exercise programs and arthritic medication will be beneficial, as will some activity modification. Severe cases, where the ability to walk, climb stairs, sit or rise comfortably is always painful, can be successfully treated injections. If that fails the ultimate intervention is hip surgery or hip replacement surgery. If you are experiencing constant hip related pain issues, visit a medical specialist for an expert diagnosis and professional treatment protocols. The labrum is a ring of cartilage that is attached to the outside rim of the socket of the hip joint. The labrum acts as a cushion and a seal that holds the ball at the top of the thigh, which fits into the hip socket, securely in place. If this cartilage ring, or labrum, is in anyway damaged or torn, it is known as a labral tear. 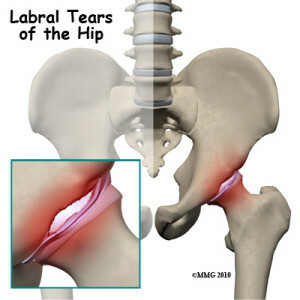 What causes the hip labrum to tear? There are two general types of hip labral tears. One is as a result of a traumatic injury such as a fall, or a sports injury, particularly from hockey, soccer or football. The other type of hip labral tear is related to degeneration of the bones and muscles as a result of repetitive use and activity. This kind of tear can also be a sign of early stage hip arthritis. Are there any signs which would alert me to a torn hip labrum? A locking or clicking sensation in your hip joint. Constant pain in the hip or groin area. A much reduced and limited range of hip mobility accompanied by stiffness in your hip joint. What kind of treatment protocols are recommended? Because of the resultant inflammation in the hip joint, the first course of action is usually anti-inflammatory medication, accompanied by as much rest as possible. If this is successful and the inflammation subsides, the symptoms may be relieved. Physical therapy techniques can be useful to strengthen the muscles and ligaments around the hip joint. A cortisone injection is also a most beneficial option to relieve pain and inflammation. If these treatments do not help, are there other options? Yes, your surgeon may consider a hip arthroscopy, which includes the insertion of a small camera into the hip joint to evaluate the extent of the labral tear. You could then undergo hip surgery which will involve the shaving out or repairing of the torn section. Depending on the work that needs to be done, you could be out of action for up to 12 weeks as you take the time to recover. During this time, pay attention to your doctor’s advice if you want a full and successful recovery and a quick return to normal activities. What exactly is Hip trochanteric bursitis? Trochanteric bursitis, also known as greater trochanteric pain syndrome, is inflammation in the bursa which is situated between the large tendon and the bony bump on the side of the hip. This bony bump is known as the greater trochanter.The bursa is a pad-like sac which cushions the movement, and prevents friction, between bones, tendons and muscles near joints. An inflamed bursa reduces the cushioning effect and is known as trochanteric bursitis, usually on the side of the hip, causing a degree of pain which is often self-limiting. Although this problem is more common in older individuals,it may also occur in younger folk who are very active in sports such as running or cycling. Sometimes trochanteric bursitis can occur because of an injury to the bursa itself, while at other times it can gradually make an appearance when there are no obvious signs of injury. Advancing age and the resultant wear and tear from activity can be another underlying cause. Hip replacement, or other types of hip surgery, which might alter the way the hip works, could also lead to the development of trochanteric bursitis. The first symptom of trochanteric bursitis is usually pain, mostly in the hip area right over the bump that forms the greater trochanter. The pain could also radiate down theoutside of the thigh, and if not treated, can lead to a limp when walking and stiffness in the hip joint. Eventually pain may also be present when lying down in a certain position, making it difficult when sleeping. The diagnosis begins with a physical examination to seewhich movements cause the pain, how much stiffness is in the hip, and if you are walking with a limp. X-rays do not show trochanteric bursitis, but may be suggested to establish whether there are perhaps other hip issues which could be causing pain. Is there any treatment available which will help? Trochanteric bursitis is often treated successfully without the need for surgery. Visits to a physiotherapist might be scheduled, and perhaps a course of anti-inflammatory medication. You will probably be advised to curtail physical activities for a while until the pain lessens. In more severe cases a cortisone injection can be given straight into the bursa which will reduce swelling and ease the pain for a fair length of time. If all else fails and you are considerably disabled by pain, your doctor may recommend surgery. There are several types of surgical procedures available to treat trochanteric bursitis, and a surgeon will advise you as to which will the most suitable for your problem. All of the surgical procedures give good, long lasting results which are beneficial to the patient. If you constantly have pain in the side of your knee, you are probably suffering from iliotibial band syndrome, also known as ITB. This is a common and often persistent knee injury, causing pain mainly on the outer side of the knee. If you have pain in the hip or the thigh, it is not ITB. Mostly iliotibial band syndrome is a relatively simple condition, usually treated by resting from physical activities until the pain subsides. However, if you cannot get rid of it just by resting, the condition could be more serious than you think, and permanent damage might occur in the long term. What exactly is the iliotibial band? The iliotibial band is described as a large tendon running down the side of the leg, from the hip to the knee. It is a complex connective tissue structure with characteristics of both a tendon and a ligament. What causes the painful ITB syndrome? ITB syndrome is an injury caused by overuse of the outer thigh and knee. Inflammation may result increased friction as the iliotibial band rubs against the bony outcrop on the side of the knee joint. This injury is very prominent amongst runners and cyclists, but can actually affect anyone participating in vigorous sports such as squash, tennis, basketball, and even weight lifting, where a lot of squatting on the heels adds pressure to the IT band and knee joint. Quite often a doctor will make a diagnosis from the description of the patient’s symptoms, with a physical examination to establish where the pain is. What are the treatment options for ITB syndrome? Treatment will include rest, ice, compression and elevation. Possible physical therapy to help reduce inflammation of the IT band. Are these treatments always successful? The conservative, non-surgical treatment is usually a success. But if, for example, the symptoms have been ignored over a period of time, scarring may have taken place causing additional pain and a decrease of knee mobility. In this case, surgery could be an option to repair the damage. Arthroscopy, which is minimally invasive, can be used to cut away the inflamed area around iliotibial band. This method can also be used to potentially lengthen the IT band for greater ease of movement. There is no miracle cure for ITB syndrome, but prevention measures will help keep it at bay! Always warm up properly, stretching all the muscles concerned, before exercising or starting to play your game of sport. To learn more about the safest hip surgery options in Southern California, please don’t hesitate to contact the experts here today. When medication, therapy, injections and the use of walking supports fail to provide pain relief and restore function, total hip-replacement surgery is an alternative. Technically called an arthroplasty, the procedure generally reduces discomfort and improves patients’ range of motion. The operation has a high success rate, due to improvements since the first hip replacement in 1960. Each year, U.S. surgeons perform more than 285,000 such procedures. Arthroplasty entails extracting damaged bone and cartilage, then implanting prosthetics. The surgeon removes the head of the femur and replaces it with a metal stem that extends into the femur’s hollow center. The stem is pressed into place; sometimes a surgeon may wedge the metal implant into the thigh bone, and sometimes cement is used to hold the implant in place. A metal or ceramic ball is affixed to the top of the stem as a substitute for the femoral head. The next step is replacing damaged cartilage on the surface of the hip socket with a metal socket. In some cases, it is necessary to use screws or cement to secure the device. The surgeon installs a spacer (made of plastic, ceramic or metal) between the prosthetic ball and socket to reduce friction. Metal on metal implants (which are no longer used), use a metal ball and metal cup with no intervening plastic. Most patients receive general anesthesia before the operation. Some are administered spinal, epidural or regional nerve blocks that numb their lower bodies. Anesthesiologists determine which method is best for individual patients. Factors that doctors and orthopedic surgeons consider in recommending total hip replacements include patients’ pain levels and degrees of disability. Most people who undergo the procedure are between 50 and 80 years old. However, arthroplasty has been proven effective for patients of various ages, from young people suffering from juvenile arthritis to elderly victims of degenerative arthritis. Symptoms that qualify patients for hip-replacement surgery include: 1. Pain in the hip that impedes walking and other activities, especially groin pain 2. Pain that persists even without moving the hip 3. Stiffness that makes it hard to raise or move a leg 4. Failure to get relief from conventional treatments 5. Inability to navigate stairs with a reciprocating gait 6. Significant limitation in walking distance In determining whether hip replacement is appropriate, surgeons consider patients’ medical histories, the amount of pain they are experiencing, tissue damage and deformity, and the extent to which patients are able to perform everyday activities. Doctors use diagnostic imaging equipment like x-rays and MRIs to assess hip strength, mobility and alignment. Following surgery, patients are advised to refrain from sports and other strenuous activities that place excessive strain on the hip. Such exertion wears down the prosthetic materials, shortening the time it takes for them to become loose and cause pain. Even normal activities like walking can eventually erode the material between the socket and femoral head. However, when not overly stressed, hip replacements generally last for many years. To prevent injury, and to promote healing, postoperative patients often install handrails along stairways and in bathrooms in their homes. Sitting with the knees lower than the hips, while keeping the back straight, enhances recovery. Other recommendations include a raised toilet seat, a chair in the shower, a sponge or shower hose with a long handle, a long stick to aid in putting on socks and other clothing, and a grabber (or reacher). The objective is to avoid bending the newly repaired hip too far or too often. If you have been told that you need a hip replacement or want to inquire about the procedure, schedule an appointment with our top notch and nationally recognized sports medicine specialists at Orthopedic Surgery San Diego.